comes from accurate GPS of S908 fitness tracker. but not suitable for deep diving.It can automatically record swim laps,heart rate,swing arm count,calorie,swimming times. Also can save your sports data. Monitoring time for the 21 PM-9 AM sleep data,it can record the light and deep sleep .Last night sleep date is generated at 9 AM the following day . Support call reminder,SMS, Facebook, Twitter, WeChat,etc.When you receive a new message or phone call,it will vibration and display. Support within 2meters of water depth,don't support the brewing hot water, hot bath and water vapor. When you monitor your heart rate,you should tight the smart band with your wrist,or it will be inaccurate. You should connect to the phone via Bluetooth while you want to show your motion trajectory,otherwise it won't be show. 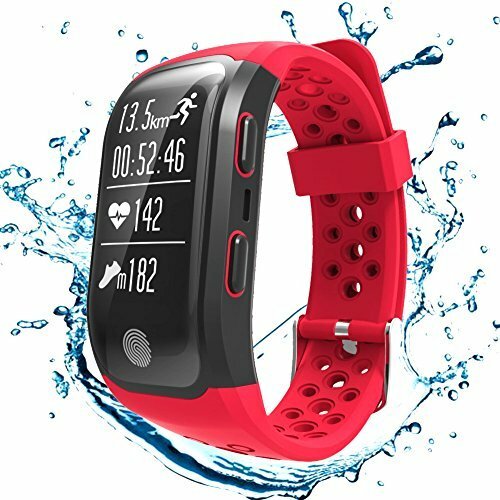 【FITNESS TRACKER FOR SWIMMING】S908 fitness tracker has ip68 waterproof that show the excellent waterproof effect when you swim to wear it.And you can turn on the swimming mode，it will count your heart rate,calories, arm swings and so on .This swim fitness tracker will be loved by swimmers.But it's not clear display in the bright sunlight of outdoor sports, which is the defect of all white screens display. 【INDEPENDENT USE OF SMART BAND】This fitness band built-in 3D accelerometer and gyroscope, real-time data testing can help you do sports scientifically.And you can choose saving or delete your workout stats without taking your phone when you choose 5 sports mode.If you need to get the GPS trajectory map ,you should link your smart bracelet in the "HPlus Watch" app via bluetooth. 【REAL-TIME HEART RATE MONITORS】The activity tracker has real-time understanding of the motion state with 16 hours of dynamic heart rate monitoring.And you can set maximum heart rate and minimum heart rate reminder to monitor your movement.So it's a good assistant for your heart rate management. 【MULTIFUNCTIONAL FITNESS WATCH】Time & date display, calories burning Monitor,heart rate monitor,sleep monitor, sedentary remind ,alarm,timer,stopwatch, notification of incoming and message,ect.It even consumes less power and can generally standby for 20 days.Also you can transform mile or kilometer in the "HPlus Watch" app. 【WIDE COMPATIBILITY&100% GUARANTEE】:S908 fitness watch can perfect compatibility with Android 4.3 or above like Samsung S7/S8 ,iOS 8.0 or above like iPhone 5/6/6s/7/8. Any questions about our products or service, please do not hesitate to contact us. We will do our best to solve and improve it ASAP. Full 2 years warranty. If you have any questions about this product by GooPhone, contact us by completing and submitting the form below. If you are looking for a specif part number, please include it with your message.